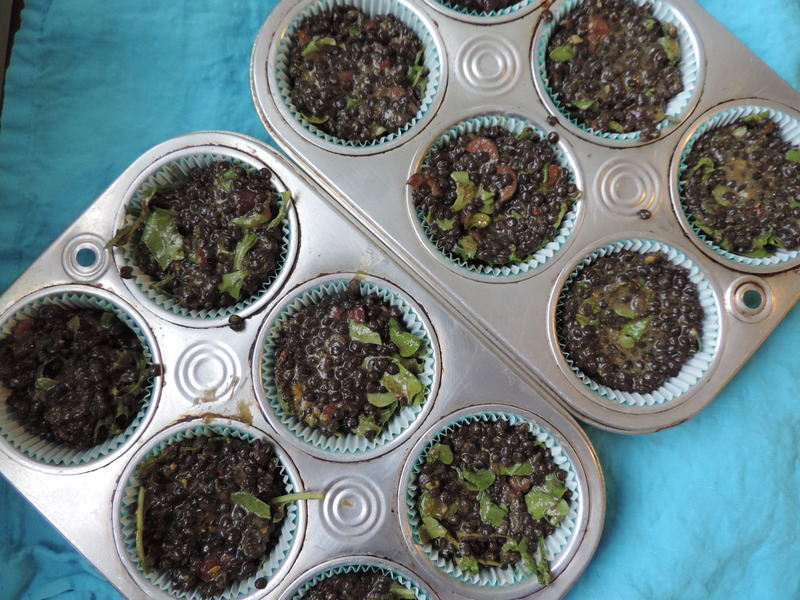 Black Lentil Muffins – Made from Leftovers! I have a confession to make: I love leftovers! Absolutely love them. First of all, they allow me to get creative in the kitchen, which — you guessed it — I love. More than that, though, it’s great to know that I’m using up all of my food because ain’t nobody got time for wasted food. So when I recently made Chicken Cacciatore and had leftover black beluga lentils and the delicious tomato-y sauce that the chicken was cooked in, I figured — ‘hey, I can make something DELICIOUS with that!’ Combined with a recent discovery of lentil loaf (thanks to my friend/master chef Pam), lentil muffins seemed like a natural choice. Did I mention these are incredibly easy to make? And that you can cook up a whole batch and then freeze them for later use? Leftovers of leftovers? Getting crazy here! 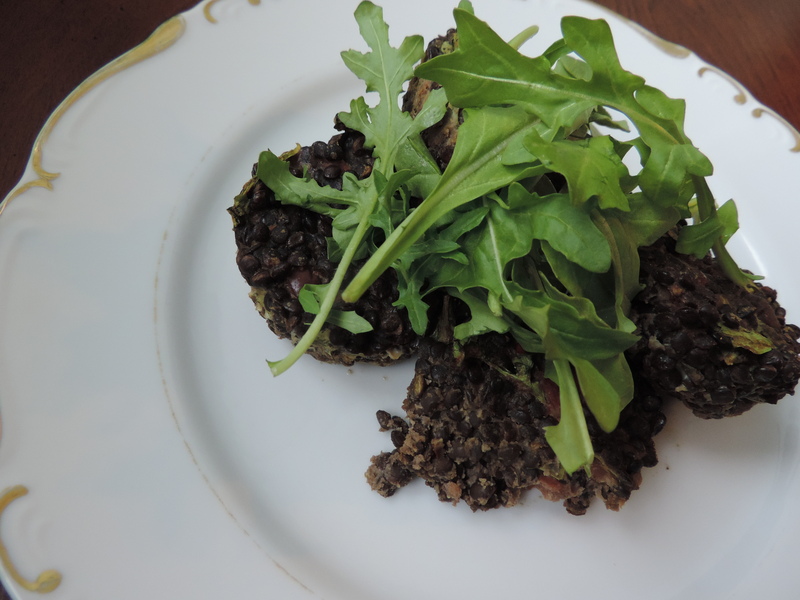 Black beluga lentils can be found at most grocery stores. 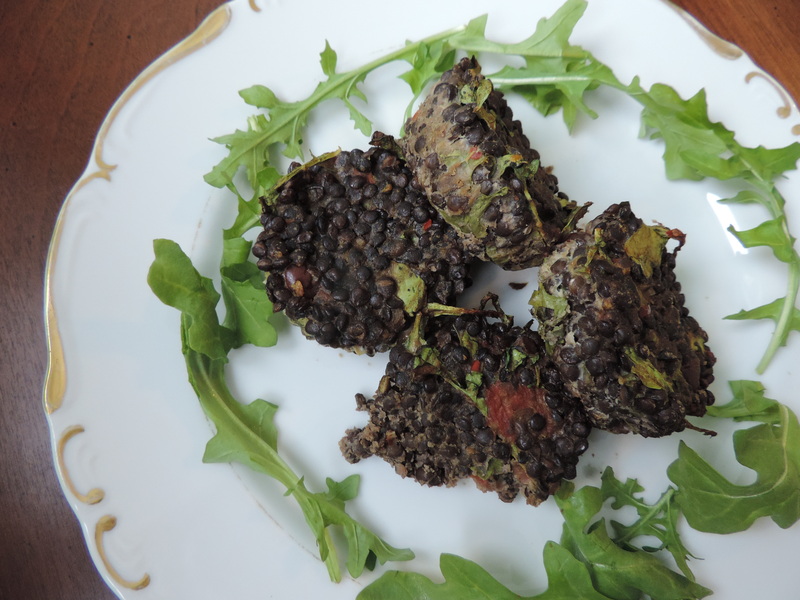 They are full of protein and fiber as well as anthocyanins (powerful antioxidant compounds). 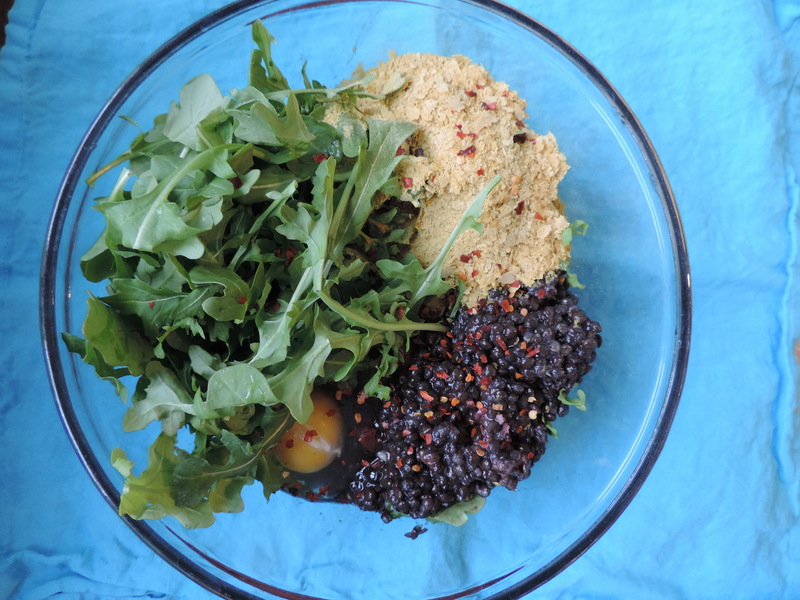 Nutritional yeast lends a cheesy, savory flavor along with protein and B vitamins. Find it at Whole Foods or a health foods store. *Please note that due to the use of leftover tomato sauce in which chicken was cooked, this recipe is NOT vegetarian. However, if you use pre-made pasta sauce or make your own, you can keep it vegetarian. 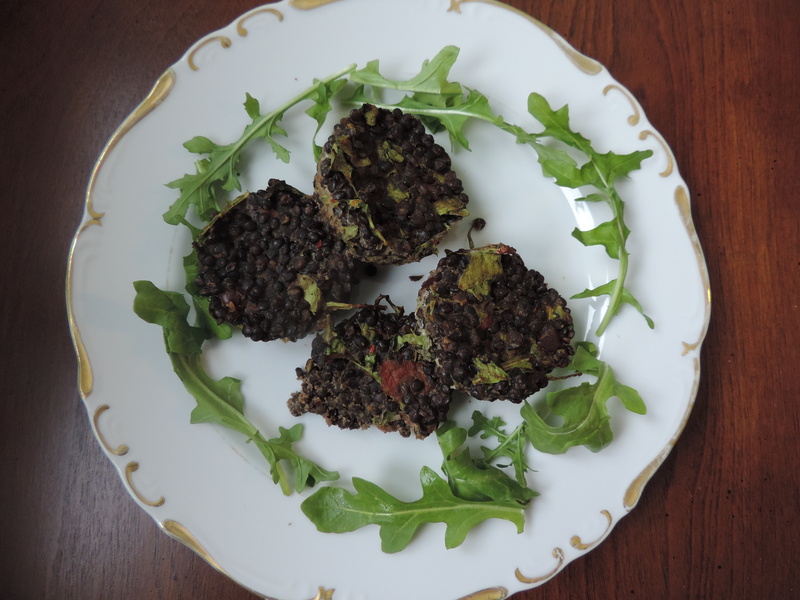 Enjoy warm or cold, over salad, with eggs or by themselves. These are delicious dipped in hummus as well! Happy Halloween! Are you up to your ears in nougaty, caramely, chocolatey-ness yet? Get back on the right (read: healthy) track and eat some veggies! Since it’s Halloween you know that it’s also fall and with fall comes a whole slew of delicious and nutritious foods – cranberries, sweet potatoes, turkey and brussel sprouts to name a few. One of my favorite fall foods, though, is squash. Butternut, spaghetti and acorn squash are my top picks, though really I like them all – I don’t discriminate. The other day I was baking my spaghetti squash and figured I might as well save time and make my butternut squash too. This was a great idea (gotta love efficiency!) until I realized that I had TONS of squash to use up. One can only eat so much squash on its own, so I had to find a way to transform the squash. 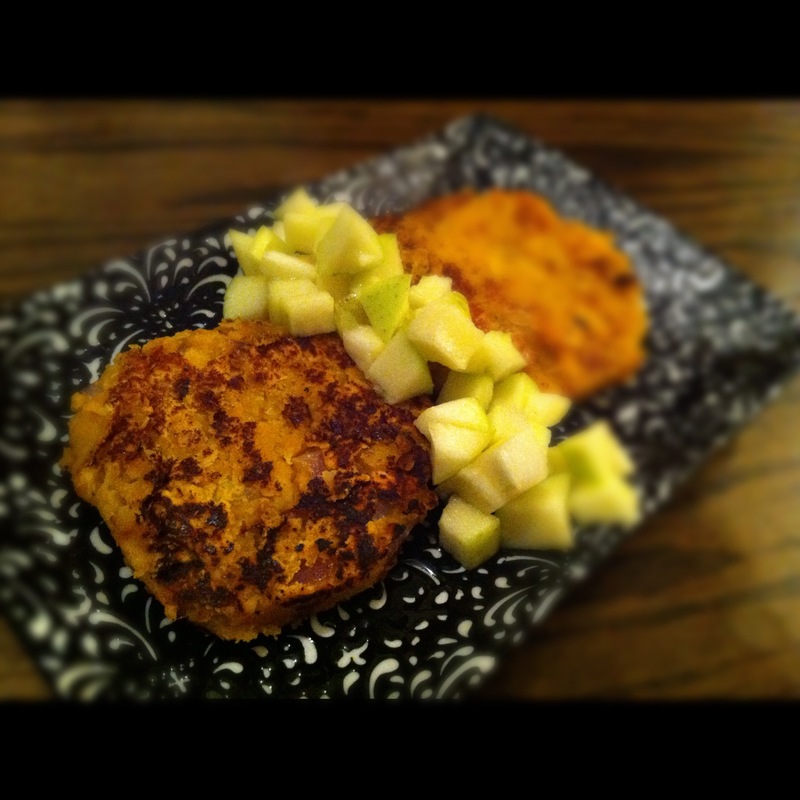 I set out to make squash cakes but in order to up the protein I also added in lentils (so that I could make the squash cakes my dinner rather than having to cook a protein to balance things out). Since I’ve been loving lentils lately (the split ones only take 15 minutes to cook! 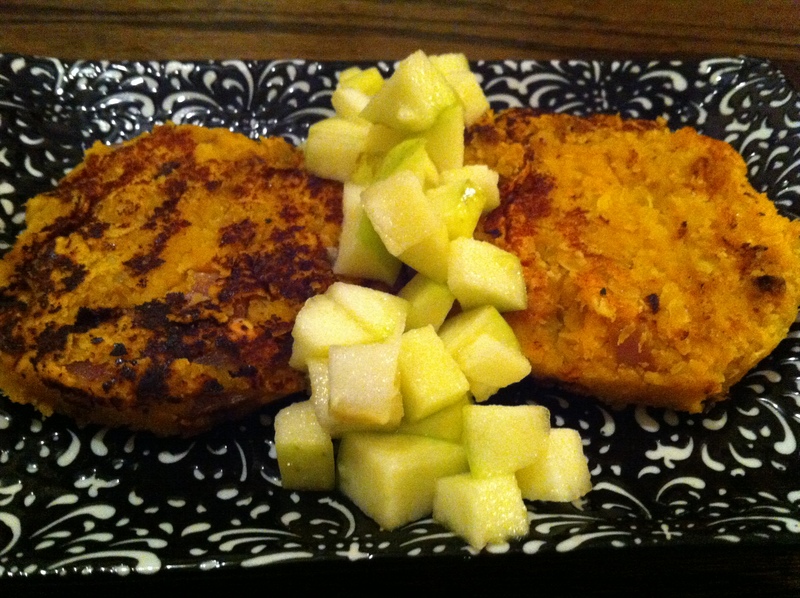 ), I decided on a curried butternut squash and lentil cake. Butternut squash is an excellent source of vitamin A (more than 250% your recommend daily intake for just 1/2 a cup of the stuff) and vitamin C, plus iron. Lentils are also loaded with iron, along with protein and potassium. That makes for one fantastically healthy cake! Add some curry powder and other spices and top with an apple “salsa,” and they become a delicious cake too. 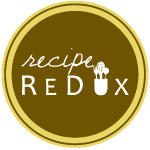 Oh and an added bonus – because of all the fiber in both the squash and lentils, these will make you feel super-full without loads of calories. Cook lentils according to package directions. 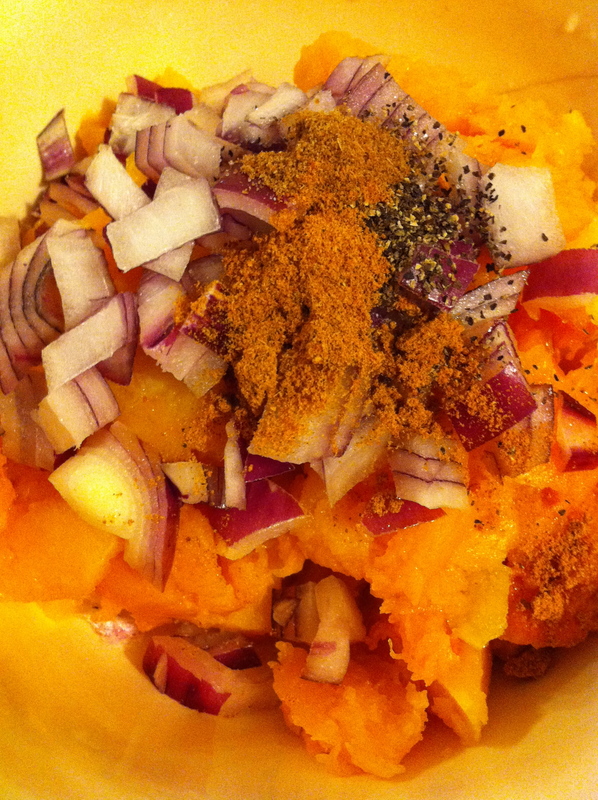 Mash squash and lentils together and add remaining ingredients. Heat a large pan and spray with cooking spray. Form squash mixture into patties and drop into pan. Cook for about 5 minutes on each side. *Note: mine were a bit fragile (mushy), so I baked them at 375 for 10 minutes just to stiffen them up a bit. They are delicious either way, though.